Interested in taking your degree to the next level? Add a Master’s in Computer Science, no prior experience in programming required. Come see how your background in Science can be combined with Computer Science to give you the ability to work at the juncture of both. This hour and a half workshop will give you an understanding of the basics of algorithms and computer science and introduce you to what research looks like in the computational sciences. The CCIS ALIGN program is designed for people with little to no prior programming experience that are interested in combining their skills and undergraduate education with computer science. The program provides bridge courses to give you the technical foundation you need to be successful in the MS in Computer Science program. Our students come from every possible background including English, Political Science, Biology, Economics, Journalism, Media Studies, Health Sciences, Nursing and more. Most of our ALIGN MS in Computer Science students have no prior coding or computer science. The ALIGN program is offered in Boston, Charlotte, Seattle, and Silicon Valley. 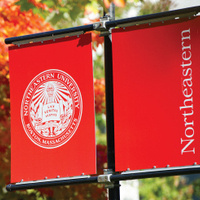 Students will gain 6-8 months of work experience in Northeastern’s co-op program. Many are offered jobs by their co-op employers. All graduates of this program are employed making $100,000+ salaries. Come and learn more about this opportunity over dinner! Register for this free workshop as space is limited.